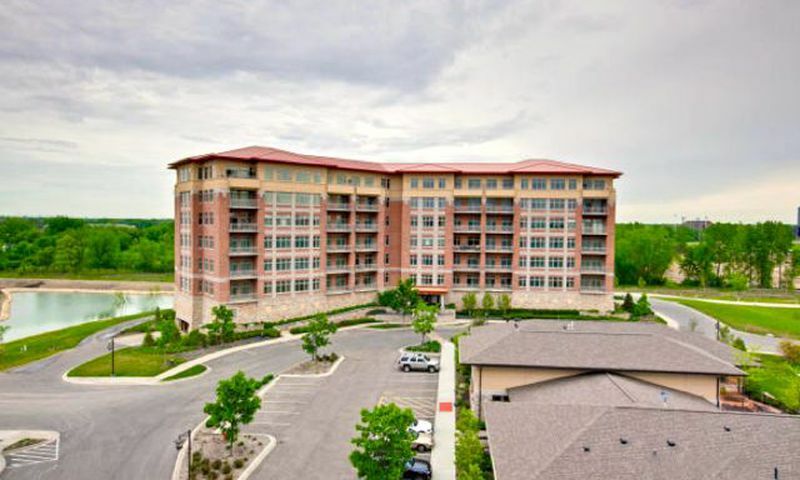 Prairie Park is a luxurious collection of condominiums in Wheeling that is comprised of five mid-rise buildings. This aptly named community is located on 18 acres of prairie-inspired surroundings. Situated among aquatic plants and evergreens, its stylish entry is also enhanced by waterfalls and granite boulders. While not age-restricted, the low-maintenance lifestyle at Prairie Park appeals to retirees and active adults. The amenities include a clubhouse as well as a full-time activity director. In development since 2004 by the Smith Family Corporation, this luxurious development contains a total of 240 residences. Much of the social activity of Prairie Park in Wheeling centers around the clubhouse facilities. The clubhouse features several areas: a party room/lounge with kitchen for social events as well as hobby, game and card rooms to pursue arts and crafts. Residents can stay in shape at the fitness center by utilizing the aerobics and dance studio as well as the indoor pool. The clubhouse grounds are ideal for social activities and contain a barbecue patio, bocce ball courts and a stunning terrace with lake views. Prairie Park offers twelve models designed to offer between 1,289 and 2,277 square feet of living space. Buyers can select from one, two and three-bedroom units with one-and-a-half to two-and-a-half bathrooms. The builders have carefully chosen all aspects of the condos to reflect the utility and comfort of single-family homes. The condos are even as quiet as detached homes because of the large insulation spaces and amount of concrete between each floor. All units at Prairie Park are equipped with Andersen Windows to create a feeling of spaciousness and to let in plenty of natural light. All floor plans have a private terrace for unsurpassed views. In addition, each terrace has a gas line so residents can enjoy outdoor grilling. The kitchens feature top-of-the line cabinets and counter tops as well as fixtures and appliances by recognizable manufacturers like Kohler, Andersen and GE. The lobbies of each building are tastefully designed and feature stone fireplaces, Frank Lloyd Wright Series stained glass and original art pieces. Prairie Park offers a convenient and private lifestyle with cascading waterfalls, serene lakes and spectacular landscaping. All condos were carefully designed with meticulous attention to details and offer majestic views. A full-time activities director maintains a social calendar, and residents can choose their activity level to suit individual lifestyles. Situated west of Milwaukee Avenue (Route 45) across from the Westin Hotel, Prairie Park in Wheeling is within walking distance of golf courses, upscale dining establishments like Rick Tramonte's, and neighborly coffee shops. Prairie Park offers easy access to East-West and North-South corridors via its proximity to Route 53, The Eden's Expressway and the 294 Tollway. In addition, residents will find two Metra stations just a short drive away. Adjacent to the Westin Hotel lies The Forest Preserve. It offers biking and walking trails among trees, rivers and lakes. Additional recreation options can be found half a mile away at the Wheeling Recreation Park and Aquatic Center, as well as the Chevy Chase Golf Club, which is five minutes away from Prairie Park. Downtown Chicago is a short 25 miles from Prairie Park and easily accessible by car or train. Check back soon for more information on the lifestyle in Prairie Park. Each condo owner has one parking spot in the heated garage of their building. Prairie Park is perfect for my wife and I! Our condo here is fantastic because there is absolutely zero maintenance leaving us more time to spend doing fun things like golfing, trying out new restaurants, going to Bears and Cubs games, etc. We simply wanted a place that had a nice pool, a gym, a good location and maintenance-free lliving. It's been great! 55places.com is not affiliated with the developer(s) or homeowners association of Prairie Park. The information you submit is distributed to a 55places.com Partner Agent, who is a licensed real estate agent. The information regarding Prairie Park has not been verified or approved by the developer or homeowners association. Please verify all information prior to purchasing. 55places.com is not responsible for any errors regarding the information displayed on this website.